This modestly scaled sectional sofa offers a perfect gathering place for your home's living room, family room, or more. The dramatic curves of the arms provide a transitional update to classic rolled arms for a sophisticated style that complements the comfort of this stationary sectional. 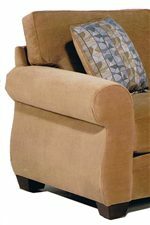 With many fabric options available by special order, you are sure to find a main upholstery fabric and the four accent pillows to complete your sofa group. 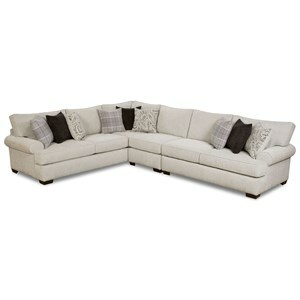 Many other modular sectional pieces are available. View the collection and see the schematic for details. The Alfred 2-Piece Stationary Sectional with Rolled Arms by Jonathan Louis at Thornton Furniture in the Bowling Green, Alvaton, Glasgow, Scottsville, Franklin area. Product availability may vary. Contact us for the most current availability on this product. 53026R RAF Condo Sofa 1 72" 38" 30"
53032L LAF Sectional 1 97" 38" 30"
The Alfred collection allows you create a stylish and comfortable seating group for in-home entertaining. From the eye-catching, contemporary rolled arms to the welt cord trim for a finished look, your choice of the stationary sofa, sectional group, ottoman and other pieces not shown let you create the ideal group for spending time with friends and family, no matter the activity. With a diverse variety of fabric colors and prints available by special order, you can customize the final look of the collection to match your decor style. The Alfred collection is a great option if you are looking for furniture in the Bowling Green, Alvaton, Glasgow, Scottsville, Franklin area. Browse other items in the Alfred collection from Thornton Furniture in the Bowling Green, Alvaton, Glasgow, Scottsville, Franklin area.